HiTex™ is manufactured with various diameters, pitch (space between rings) and lengths to meet the needs of any job site. Plus, Hitex™ is the only duct that is manufactured with our unique Tuffguard™ scuff strip, which provides 360° protection around the entire length of the hose. Tuffguard™ ensures a longer lifespan, so you replace hoses less often, saving you time and money. Hitex™ is manufactured with a 6″ pitch (not 7″ like most other hoses available), which provides 15% more wire support, a better bend radius and more protective rings! 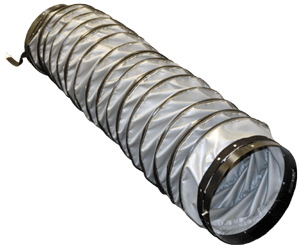 We also manufacture Insulated HiTex ducting, which is has 5 effective insulated layers.